Based on the popular QuadPod™ architecture from JTAG Technologies, the JT 2147/eDAK is an enhancement of JTAG ‘s current DAK interface and has been specifically designed for robust high-integrity ATE systems. In using the JT 2147/eDAK, test system builders will greatly simplify their wiring task and, at the same time, retain the excellent signal integrity assured by the QuadPod’s active interface. 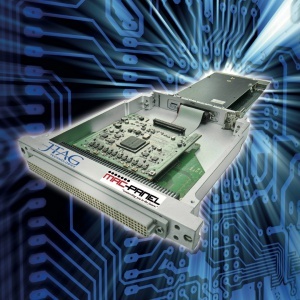 In addition to four independent JTAG Test Access Ports (TAPs), the JT2147/eDAK features 64 digital I/O scan channels plus 16 ‘static’ DIOs. Each TAP can be programmed to operate through a range of voltage levels and two can also operate as other test and programming interfaces such as BDM or SWD. eDAK adapters utilize standard MAC Panel series connector modules, providing a wide variety of contact types. The connection between the PXI instrument and receiver module is accomplished using either a passive printed circuit board, active signal condition module (as with the JT 2147/eDAK) or flex circuit, with each providing optimum connectivity performance while reducing wiring cost.